Perry To Boy: Evolution 'A Theory' With 'Gaps'; Equates It To Creationism : It's All Politics A day after he publicly questioned the science supporting the expert consensus that human activity contributes to global warming, Texas Gov. Rick Perry stuck a skeptical tone about evolution in response to a child's question. Texas Gov. Rick Perry at Popovers on the Square in Portsmouth, NH, August 18, 2011. A day after he publicly questioned the science supporting the expert consensus that human activity contributes to global warming, Texas Gov. Rick Perry stuck a skeptical tone about evolution in response to a child's question. 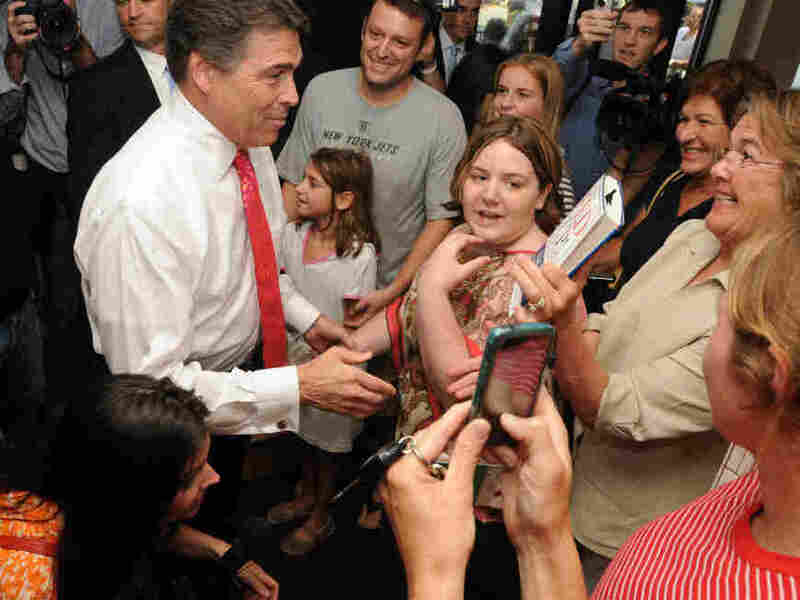 NPR's Ari Shapiro who was covering Perry's campaign Thursday, reports that during the Texas governor's visit to Popovers coffee shop in downtown Portsmouth, a boy asked the Republican seeking his party's presidential nomination how old the world is. How old do I think the earth is? You know what? I don't have any idea. I know it's pretty old. So it goes back a long, long way. I'm not sure anybody actually knows completely and absolutely how old the earth is. I hear your mom was asking about evolution and, you know, it's a theory that's out there. It's got some gaps in it, but in Texas we teach both creationism and evolution in our public schools. Because I figure you're smart enough to figure out which one is right. For the record, scientists believe the age of the Earth to be about 4.54 billion years old, give or take a few tens of million of years. Obviously, this result of the scientific method is a conclusion many fundamentalist Christians like Perry don't accept. The same can be said for evolution. The "gaps" Perry mentioned are certainly there. For instance, how exactly life began is a foundational gap in evolution, not well understood now though that doesn't mean it will always be a scientific mystery. But as far as science is concerned, evolution, gaps included, remains the best explanation for life as we know it in all it's various forms. Creationists take the gaps in the theory of evolution as an opportunity to argue that those missing pieces make evolution flawed as an explanation, and say it boosts their case for life being created by God as the Bible describes. That's where Perry was coming from. Creationism has gaps, too, of course. (Where did God come from?, for instance.) But Perry apparently didn't acknowledge those. One challenge Perry faces here in New Hampshire is translating his success in socially conservative Texas to this northeastern state where Republicans tend to be more moderate, and fiscal conservatism trumps social issues. During his first week in the field, he has made waves by dismissing global warming and suggesting that the chairman of the Federal Reserve is treasonous. On Wednesday in an appearance before a New Hampshire business group, Perry took issue with the expert consensus that humans are contributing to global warming. As with his response on the Earth's age and evolution, he dismissed the consensus as a theory and left the impression that there was a growing number of equally qualified experts who doubt the scientific evidence for human-caused warming. He also suggested that the only manipulated scientific data supported the consensus. The Washington Post's Glenn Kessler does an effective job of dismantling Perry's assertion in his The Factchecker blog.